Tim Chavez, the love-him-or-hate-him Tennessean columnist known for his advocacy of the poor, afflicted and otherwise marginalized, has survived a two-year-long battle with leukemia that nearly killed him. But while he ultimately managed to keep his life, he couldn’t hang on to his job. The Hispanic Nashville Notebook has approached Chavez about writing for this site. 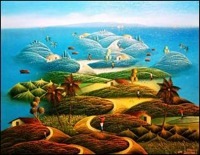 "Titled Nashville's Internationals, the show features contributions from artists representing Haiti, Venezuela, Belgium, Germany, Croatia, Russia, China, The Philippines, Nigeria and Sudan. In some cases, their work couldn't be more different, but all represent a common urge to give voice to their experiences through painting, sculpture, drawing and other visual media." "Nashville's Internationals is timed to coincide with Metro Parks' and Scarritt-Bennett Center's Celebration of Cultures, a free festival in Centennial Park on Oct. 6-7. This art exhibit lends an added dimension to what should be a fun, family-friendly occasion." 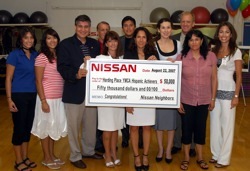 Nissan North America, Inc. announced in August that it had contributed $50,000 to the Hispanic Achievers – a program of the YMCA of Middle Tennessee. The Hispanic Achievers Program’s purpose is to help children, youth, and adults in the Hispanic community achieve their educational goals and better their lives. The Hispanic Achievers Program also seeks to direct families on the right path, looking for ways to develop strong academic and educational foundations, to discover their cultural identity, and to establish leadership roles among its participants. Nissan recognizes the numerous strides that the Hispanic Achievers Program has made since its inception in 1992. In North America, Nissan's operations include automotive styling, design, engineering, consumer and corporate financing, sales and marketing, distribution and manufacturing. More information about Nissan in North America and the complete line of Nissan and Infiniti vehicles can be found online at www.NissanUSA.com and www.infiniti.com. Pictured, from left, are: Lucia Munoz, Hispanic Achiever; Karla Munoz, Hispanic Achiever; Josias Arteaga, Hispanic Achievers Director; Jim Barr, Harding Place YMCA Board Chair; Amy Kerr, Harding Place YMCA Executive Director; Dennis Bermudez, Hispanic Achiever; Stephanie Valdez Streaty (Nissan), Alexandra Amelang (Nissan), Stewart Bronaugh, YMCA of Middle Tennessee We Build People Co-Chair; Senora Munoz, Hispanic Achiever; and Jan Berry, YMCA of Middle TN Sr. Regional Development Director. "Most prestigious national award presented by SHPE to a SHPE member"
Christella J. Chavez of Visteon/Ford Motor Company in Nashville was selected to receive the Jaime Oaxaca Award, the most prestigious national award presented by SHPE to a SHPE member. Chavez is being honored for her unselfish and outstanding contributions to the fields of engineering and science and to the Hispanic community. Chavez has established two new professional chapters in Oklahoma and Tennessee and was instrumental in establishing SHPE student chapters at the University of Tulsa, Tulsa Community College, Oral Roberts University and Tennessee Technological University. She has served in the U.S. Army and U.S. Army Reserves for the past 18 years and is dedicated to SHPE and a number of other Hispanic initiatives. The annual awards recognize the year’s highest level of achievement in Hispanic engineering in several different categories and will be presented at the 2007 SHPE Conference in Philadelphia on Oct. 31-Nov. 4. Chriss Chavez, a manufacturing superintendent with Visteon Corporation's (NYSE: VC) Nashville (Tennessee) Glass Plant, has been honored with the company's Summit Award for her outstanding commitment and dedication to the community, as well as her leadership abilities. An employee since 1998, Chavez has been helping the local community through such activities as the United Way, the Corporate Challenge program, Executive Women International, Society of Hispanic Professional Engineers and the Hispanic Chamber of Commerce. Formerly an employee of the Tulsa Glass Plant, Chavez works as a manufacturing superintendent in the Gravity Sag windshield manufacturing area of Visteon's Nashville Plant. "Chriss' dedication and passion for reaching out and helping the community is a great example of the kind of spirited, enthusiastic employees we have at Visteon," said Mike Johnston, president and chief operating officer. "Through the Leading the Way program, we are focused on identifying those individuals and teams that go above-and-beyond, and then recognizing them for their efforts." 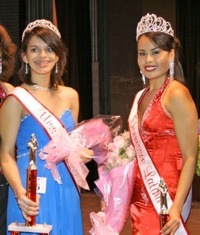 Chavez's passion for participating and dedicating her time to local organizations not only earned her a Leading the Way award, she is also one of six individuals and/or teams being recognized with a 2003 Leading the Way Summit Award. "I feel it's critically important to give of your time and talent to make the world a better place," said Chavez. "Each of us was provided with certain skills and abilities and it's up to each one of us to put them to good use." Putting her talents to work is what Chavez has been doing for the past five years supporting the Tulsa Glass Plant's United Way fund-raising campaigns, coordinating the United Way Day of Caring activities and other philanthropic events sponsored by the plant. During her time at the Tulsa Glass Plant, Chavez's passion to support local organizations didn't end at the four walls of the plant. She was also active in sponsoring the Corporate Challenge program in 2000 (a city wide corporate physical fitness competition), and earned a Gold Medal in the Most Physically Fit category for the Tulsa Glass Plant. Chavez also represented the Tulsa Glass Plant in the local chapter of Executive Women International for three years, serving as the Public Relations committee chair and volunteering on several other committees. In 2000, she helped found the Oklahoma Professional Chapter of the Society of Hispanic Professional Engineers (SHPE-OK), where she served the first year as president. She later held the role of treasurer of SHPE-OK. In 2003, she was recognized by the SHPE regional organization with a leadership award for her work in the local and national organizations. Chavez volunteered at the Tulsa Engineering Challenge, where local engineering groups provide an opportunity for children in grades 6-9 to compete in engineering build competitions at the Tulsa Technology Center. Chavez brought the plant into the Greater Tulsa Hispanic Chamber of Commerce and helped plant management recognize the business value in understanding Hispanic culture and language, which is especially important since Visteon continues to conduct business in many Latin American countries. In 2003, she was selected to the position of vice-chairperson of the Board of Directors and was slated to be the next chair. In addition to working closely with the Greater Tulsa Hispanic Chamber of Commerce, Chavez served on the Hispanic American Foundation's Board of Trustees, which provides scholarships and educational awareness to Hispanic students. She acted as chair of several community fund-raising projects that benefited local Hispanic charities and also served on the Board of Directors for the YWCA in Tulsa. As a single mother of two boys, it might seem that carrying out her job at Visteon while participating, supporting, coordinating and sponsoring so many community activities would leave Chavez with little time for herself. Although she admits it was a challenge to juggle her schedule and her two son's schedules, she managed to further her education by completing a master's degree in business administration from the University of Tulsa in August 2002. Chavez earned her undergraduate degree in engineering and political science from the United States Military Academy at West Point in 1989. She is also a military police officer in the United States Army Reserves, holding the rank of major. "My maternal grandmother went to college and raised her three young daughters by herself after her husband passed away," said Chavez. "She believed in hard work and a good education to get ahead in life … she truly was an inspiration." Chavez's enthusiasm for helping people extends to her job at the glass plant. "Working out on the floor with the teams is a terrific experience," said Chavez. " Helping them realize they can make a difference is what makes me most proud. It's very rewarding for me to be able to work side-by-side with the employees in an effort to bring about positive changes in processes and in helping to contribute to the bottom line." Launched in 2003, the Leading the Way recognition program honors employees who demonstrate exemplary performance, accomplishments or behavior that is significantly above-and-beyond expectations, or results that produce noticeable improvement in areas such as quality, value to the customer, speed and people. The Summit Award is granted annually and is the most prestigious award associated with the Leading the Way program. Visteon Corporation is a leading full-service supplier that delivers consumer-driven technology solutions to automotive manufacturers worldwide and through multiple channels within the global automotive aftermarket. Visteon has approximately 72,000 employees and a global delivery system of more than 200 technical, manufacturing, sales and service facilities located in 25 countries. Chavez is a 1989 graduate of West Point. A month ago today, on Wednesday, August 15, 2007, at 6:41pm CST, Peru experienced one of the worst earthquakes in its history. 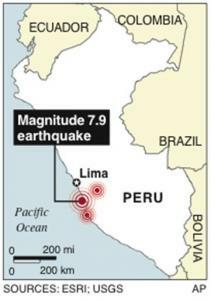 The magnitude and images of the disaster, already widely reported (e.g., 1, 2, 3, 4), have more dramatic impact when we compare it against the destruction caused by hurricane Katrina: Accounting for ratios of population size, number of deaths, and national GDP, the August earthquake has meant for Peru almost 10 times the losses and damages experienced by the Gulf Coast. 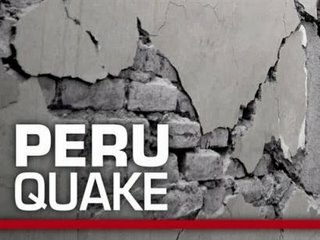 Next Saturday, the United Peruvian Association in Nashville (UPAN) is organizing a special event to channel further assistance to the devastated areas. UPAN’s website offers details in Spanish, that we translate and summarize below. Latinamerican food for sale, music shows and performances (Oscar Perez, Danny Salazar, Grupo 830, Sheyla Hicks, Marlene Gutierrez). As reported a few days ago in this website, the Nashville Symphony recently named Costa Rica native Giancarlo Guerrero as its next Music Director. The 38-year-old conductor was unanimously selected to be the Symphony's 8th Music Director by a 12-member search committee, half of whom were musicians from the orchestra. Last night marked the first returning engagement of Maestro Guerrero this season in a program that included the world-renowned violinist Midori. Fur thermore, the Symphony extended a gracious invitation to close to 30 Hispanic residents of middle Tennessee as special guests who also joined the conductor in a “meet-and-greet” gathering immediately following the performance. The adjacent photographs show part of the group (members of the Nashville Area Hispanic Chamber of Commerce*) and a candid moment between the maestro and Ms. Renata Soto, who is a fellow Costa Rican and executive director of Conexion Americas. *Hispanic Chamber clarification - There are two Hispanic chambers of commerce currently active and with offices located within Davidson County: the Nashville Area Hispanic Chamber of Commerce, and the Tennessee Hispanic Chamber of Commerce. Hispanic Heritage Month runs from September 15 to October 15. Local celebrations include Conexion Americas' invitation-only event at Cheekwood this Friday night, an invitation-only SunTrust Affinity Group Cocktail Reception on September 25, and the open-to-the-public Fiesta at Vol State on September 29 (details below). 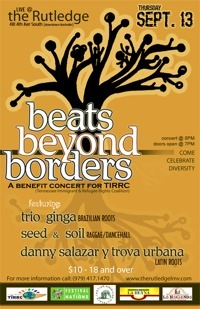 Two other events are tonight's Beats Beyond Borders concert and "Eternal Beauties," an art exhibition at the Williamson County Public Library featuring nature photographs of Javier Arrieta. A reception will be held tonight from 5:30pm to 7:30pm, and the exhibition runs through October 13. More activities are planned around town and will be announced here when possible. 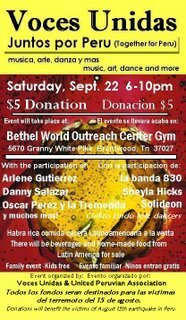 “Fiesta de Otoño en Vol State” is the Spanish name for a new fall festival coming up on September 29 in Gallatin. It means Autumn Festival at Volunteer State Community College, and it’s designed to be a celebration of Hispanic culture for the entire community. The Fiesta is a collaborative effort with local businesses and community groups. Highlights of the Fiesta include Tango and Bossa Nova music from the critically acclaimed Nashville Latin band: Serenatta Romantic Latin Ensemble. The soccer shootout contest will give local players a chance to show off ball handling skills and take shots on goal. It features prizes for the winners. Food will include Fajitas, chips, rice and beans. There will be a DJ spinning modern Latino tunes and games for the kids. There will also be an emphasis on community resources available to the Hispanic community. “Fiesta de Otoño en Vol State” will be held on Saturday, September 29 from 11 a.m.-3 p.m. on the Volunteer State Community College Campus, 1480 Nashville Pike in Gallatin. It is free and open to the public. 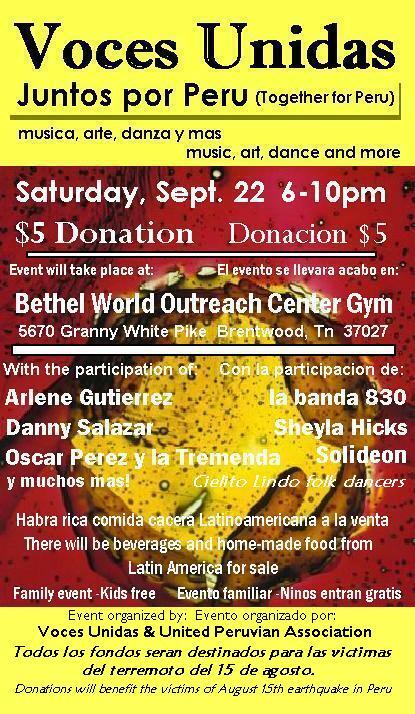 For more information in English call 615-230-3570 and in Spanish call 615-230-3398. Why is it OK to make assumptions about Hector the day laborer? I’m glad to see that Jim Boyd, in his response to a letter that states he is a racist, sees a problem with making assumptions and accusations about a broad swath of people—in this case the anti-illegal immigration community—based on the words of a few extremists (“Love/Hate Mail,” July 26). I only wish that Jim would require the same level of proof when it comes to undocumented immigrants. His website peddles a theory that undocumented immigrants are coming to take over the Southwest and either return it to Mexico or create a whole new country. He bases this assumption on the words of a few Chicano extremists and then extrapolates their views onto the 20 million or so undocumented immigrants. If it is not OK to assume Jim Boyd is a racist because he shares parallel views with some White Nationalists on immigration policy, then why is it OK to assume that Hector the day laborer is secretly plotting the destruction of America because a few Mexican Nationalists feel that way? The Nashville Scene reported here on the shutdown of one of Nashville's "notario" businesses, Ceja Enterprises, for workers compensation law violations. Mario Ramos reports here that "notario" business Ceja Enterprises has been enjoined from offering legal services. A copy of the court order is here (PDF). Miguel Torres announced the resignation of Viviana Milam as president of the Board of the Middle Tennessee branch of the National Association of Hispanic Real Estate Professionals (NAHREP). The Board has appointed Torres as interim president and chair of an effort to reorganize the group. Torres was fundamental in bringing the group together in 2004 (story here). Nashville Symphony President and CEO Alan D. Valentine announced today that Giancarlo Guerrero will become Music Director of the Nashville Symphony beginning with the 2009/100 season. A native of Costa Rica and current Music Director of the Eugene Symphony, the 38-year-old conductor was unanimously selected to be the Symphony's 8th Music Director by a 12-member search committee, half of whom were musicians from the orchestra. Leonard Slatkin, who has served as Music Advisor of the Nashville Symphony since 2006, will conclude his tenure at the end of 2008/09. Mr. Guerrero has developed a relationship with the Nashville Symphony through four subscription engagements over the past two years and was the first guest conductor to lead the Symphony following the death of its last Music Director, Kenneth Schermerhorn, in 2005. He is currently in his sixth season as Music Director of Oregon's Eugene Symphony and will continue in that post through the 2008/09 season. Under the terms of an initial 5 year contract extending through 2012/13, Mr. Guerrero will conduct 10 weeks of concerts with the Nashville Symphony in 2008/09 as Music Director Designate and 14 weeks as Music Director beginning in 2009/10. "We are all truly excited about Giancarlo's appointment," commented Alan D. Valentine. "From his first concert with the Nashville Symphony in the week following Kenneth Schermerhorn's death, the chemistry between Giancarlo, the musicians and the audience was apparent. Each return engagement since then has strengthened our relationship and reconfirmed what we already knew – that Giancarlo is the right conductor to take our orchestra to the next level. I speak on behalf of the musicians, staff and board in welcoming Giancarlo and his family to Nashville and to the Nashville Symphony." "It is a great honor to become the next Music Director of the Nashville Symphony," remarked Giancarlo Guerrero. "I look forward to wonderful music-making with the musicians of the orchestra in their terrific new hall and to continuing the orchestra's rich and long recording tradition. This is an exciting time in the orchestra's history and it is my privilege to accept the responsibility of leading this orchestra to new artistic heights. I am thrilled about working with President Alan Valentine, the orchestra's staff, board members, and the musicians of the Nashville Symphony, and my family and I are looking forward to becoming a part of the Nashville community." "The appointment of Giancarlo Guerrero ensures the continued growth of the Nashville Symphony," said Nashville Symphony Music Advisor Leonard Slatkin. "His dynamic leadership with the Symphony over the past several seasons made him the clear choice for this position. I know that he will add vitality and excitement to the community, as well as be a perfect fit for the orchestra." Giancarlo Guerrero will lead the Nashville Symphony as its first Music Director since the opening of its new home, the $123.5 million, 1,844-seat Schermerhorn Symphony Center, which opened on September 9, 2006 to critical acclaim. Both Mr. Guerrero and the Nashville Symphony are champions of American music, which the Symphony has highlighted through its American Encores initiative – featuring "encore" performances of works by living American composers and American masters that have been performed rarely or only once previously (at its premiere) - and through its award-winning recordings on Naxos' American Classics series. Mr. Guerrero initiated a guest-composer series in Eugene, where under his leadership the ensemble has hosted several of America's most respected composers, including John Adams, John Corigliano, Jennifer Higdon, Aaron Jay Kernis and Michael Daugherty. Hailed for his precise yet sensitive performances, Mr. Guerrero has guest-conducted many major American orchestras including the Baltimore Symphony, The Cleveland Orchestra, Dallas Symphony Orchestra, the National Symphony Orchestra, the Philadelphia Orchestra, Seattle Symphony and the Los Angeles Philharmonic at the Hollywood Bowl. He served as Associate Conductor of the Minnesota Orchestra from 1999-2004 and made his Minnesota Orchestra subscription debut in March 2000 leading the world premiere of John Corigliano's Phantasmagoria on the Ghosts of Versailles. Mr. Guerrero recently made his European debut with the Gulbenkian Orchestra and his UK Debut with the Royal Scottish National Orchestra. During the 2007/08 season Mr. Guerrero will conduct the Nashville Symphony's first classical series concerts on September 13-15, as well as Verdi's Requiem on May 8-10, 2008. In addition to his performances in Nashville and Eugene, Mr. Guerrero's conducting engagements this season include his return appearances with The Cleveland Orchestra both in Cleveland and on tour including the orchestra's residency in Miami. He also leads the Australian premiere of Osvaldo Golijov's chamber opera Ainadamar at the Adelaide Festival. Additional engagements include appearances with the symphony orchestras of Dallas, Kansas City, Milwaukee, San Diego, among others, and the Simon Bolivar Symphony Orchestra in Venezuela. In June 2004, Mr. Guerrero was awarded the Helen M. Thompson Award by the American Symphony Orchestra League, which recognizes outstanding achievement among young conductors nationwide. Born in Nicaragua and raised in Costa Rica, Mr. Guerrero began his musical training in Costa Rica as a member of the Costa Rica Youth Symphony. He received his bachelor's degree from Baylor University in Texas and his master's degree in conducting from Northwestern University in Illinois. Mr. Guerrero's principal conducting teachers were Michael Haithcock, Stephen Heyde, Victor Yampolsky and Guillermo Scarabino. Prior to his tenure with the Minnesota Orchestra, he served as Music Director of the Tachira Symphony Orchestra in Venezuela. Mr. Guerrero plans to reside in Nashville with his wife Shirley and daughters Virginia and Claudia. Recognized as one of the nation's fastest growing orchestras, the 84-member Nashville Symphony gives more than 200 performances annually and is rapidly developing an international reputation for unique programming and high musical standards. The Symphony's award-winning recordings and focus on new American music, coupled with the high-profile opening of Schermerhorn Symphony Center, have thrust the Symphony into the national spotlight. The Nashville Symphony has 11 recordings on Naxos and one on Decca, making it currently one of the most active recording symphony orchestras in the country. The recordings have received four Grammy nominations, including one for "Best Classical Album" in 2004 for the works of Elliott Carter. In the 2007/08 season, the Symphony's American Encores series will include performances of seldom-heard works by Richard Danielpour, John Corigliano, Michael Torke, Robert Sierra, Paul Creston, Claude Baker, Paul Hindemith, Erich Korngold, Kurt Weill and Aaron Copland, among others. Pages 65-67 of the latest issue of Nashville Parent showcase an informative overview of the practice of Spanish Immersion in different learning environments in middle Tennessee (check also the story online and included in the sister publications Rutherford Parent and Williamson Parent, too). "We feel that learning a second language increases your chances of becoming a global citizen and a life-long learner. We have people moving into our zone so they can be guaranteed a spot at our school. When our children come in kindergarten they know no Spanish. [Four years later, when they move on to middle school] the students are developing Spanish speakers. The grammar study doesn’t come until the fifth and sixth grades. Ours is more conversational Spanish. We study the culture and the history. We try to put a Latin flavor on things. [Vanderbilt University’s Spanish and Iberian Studies department] works closely with our teachers. When they bring in speakers, dancers, authors and painters, they always share those people with our school." The Parent magazine article by Ashley Driggs, managing editor and mother of three children under 7, is best at providing broad coverage of opinions, approaches, issues and resources most relevant to the learning of Spanish as a second language. We invite you to read the full story.